Turkish Airlines has added Lusaka to its expanding network as its 55th destination in Africa. Flights on the new route will be operated twice weekly, and will be in connection with Dar es Salaam. 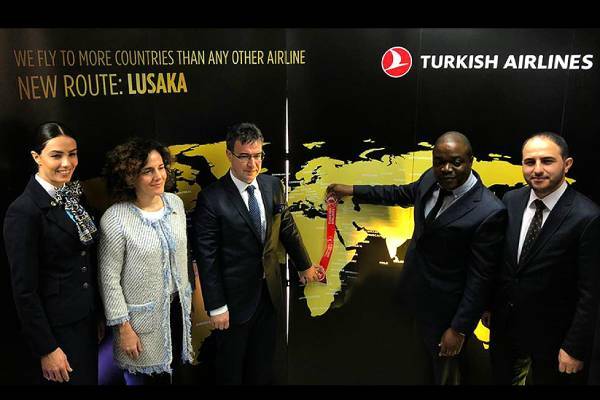 Following the addition of Lusaka, Turkish Airlines now covers 124 countries and 306 destinations worldwide. At the opening ceremony, Turkish Airlines’ senior vice president of Sales, Kerem Sarp, said: ‘‘Today, we have increased our flight network to 55 destinations in Africa. As Turkish Airlines, we are keen to expand our network in the continent. Our aim is to present our unique service quality to the world, and build bridges between cultures. We are pleased to make Zambia, which has an outstanding natural beauty that includes Victoria Falls, more reachable with the distinguished service approach of Turkish Airlines."